This text wihich I wrote in 2003 was an idea that I had already clear in 1996. At the end of the text I will add the situation we live nowadays in that respect. What is the social and political situation of the world? In this century, apart from petrol, the gold in the world is technology and science. Technology causes development and increases possibilities to science while science and development can potentiate technology. Well, there are only two reasons to be into this circle, but they are two important reasons. The first one is competition. I explained that we are included in the capitalism society. And in the system all the countries, always have to compete with other countries if they want to survive. Although we want to change this economical system and the rules of the game, we have to do this with technology, science and development, because nowadays there is no other way. The second reason is the conservation and the increase of knowledge because all that we can learn about Universe is only and finally, knowledge. Perhaps in a hypothetical future knowledge can help all the countries in the world. Although it seems fiction, knowledge could help us to escape from this planet before the sun or other things destroy it. Perhaps, science and technology will help us to compete with other extra solar civilizations, to be interesting for them to be included in an interestelar club which works better than the European Union or to fight with them, who knows? Nobody can know how a discover could be useful for us. For example, it is possible that studies of other way of energy could help us to eradicate the economical differences in the world. So considering all this. How is the health of the science in the world? This is very easy to explain. The very developmental and rich countries spend much money in science and technology than those that have less money. And because this reason, these rich countries become richer while the poor countries suffer the opposite phenomenon. So, the result is that happens with money, science and technology have a very different distribution in the world. The consequence of this is very tragic, especially in aspects that concern directly to human life. One example is that nowadays we know some solutions to increase the life of an AIDS patient from 10 to 20 years, but only in the called developed world, while in Africa, were the illness is more extended, people don´t have any chance to survive. Another example is the situation of the human genome or other genomes. Because these were studied by some private organizations, it is now possible to patent some genetic sequences or a complete animal, or a plant. In these decades, the situation went to dangerous ways and a new aspect of biology has deeply developed the bioethics. Finally we can understand that research is not only important to the economics of our country, but to our social and ethical interests. If we don´t know what are doing scientists now, we can´t have any reasonable opinion about science aspects that affects us. And the best way to know the good and the bad things of science is doing science, not only looking at it. As I said, science and development in the world are almost always related so in the world map, except some cases, science health is good in the North and bad in the South. Countries like United States, Canada, Russia and the North part of Europe are spending more money in relation with their population than South America or Africa. There are a lot of very complicated reasons to explain this. But we can understand what is happening in a very interesting place for us: Europe. It is possible to draw a line in the map of Europe that separates rich countries from poor countries. Countries like France, Norway, Sweden, Denmark, UK, Germany etc are the rich countries of Europe, while Italy, Portugal, Poland, Greece, Spain etc are the poor ones. So, the immediate question is: why Spain is less developed than our nearest neighbor, France? Well, in a short word, the answer is: history. Or in other words: fortune. We can understand that science have born in France in the seventh century, so it is not strange that then it grew there, too and meanwhile, Spain was suffering it biggest crisis. And if a country does not care about science in the moment when it appears, it is very difficult to change the situation. Because all this, nowadays, most of the Spanish scientists are obligated to work out of this country. 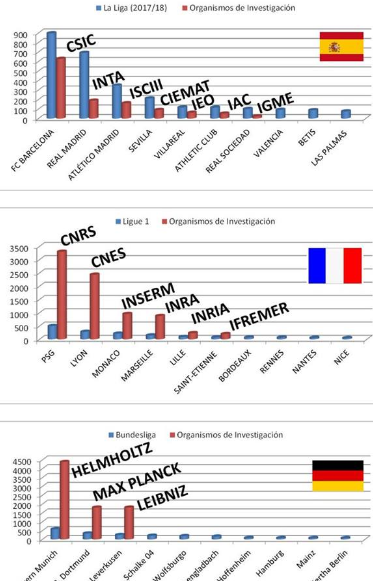 This is not the best situation for people who like science and who live in Spain. And it is like you know now, bad to Spain, too. Spain can´t live only with tourism and production forever. We have to innovate, we have to do research if we would like to have a society in the future. We have to change this, and the first thing we have to do is to inform people about our present situation and to tell them the possible consequences of that. Because countries do not invest money in science as they have money to invest. Countries invest money in science if they want a future. Is that simple. 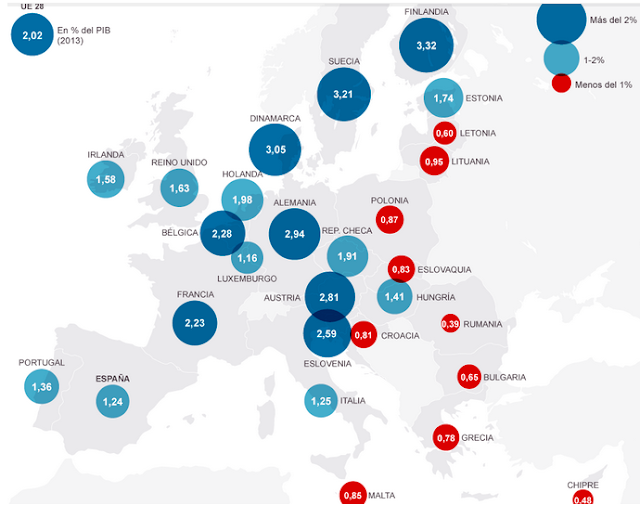 Spain invest less money per PIB than our neighbor Portugal (and this difference tends to increase). 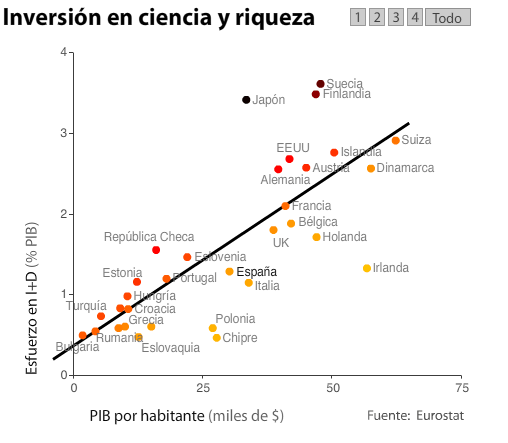 Czech Republic, with half part of the PIB per habitant than Spain does more effort investing in science than Spain. According to this I expect better future to Czech Republic and worse future for Spain progresively.